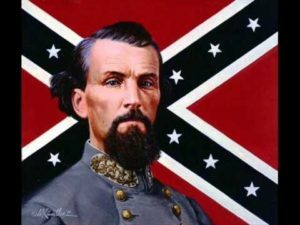 South Bay Civil War Roundtable Secretary Tom Roza provides an intriguing and detailed examination of the life and career of one of the most polarizing figures and greatest cavalrymen of the Civil War, Confederate general Nathan Bedford Forrest. Born July 13, 1821, in Chapel Hill, Tennessee, along with a twin sister, Forrest had very little formal education, yet he is remembered as a self-educated, brutal, and innovative cavalry leader during the Civil War and as a leading Southern advocate in the postwar years. Before the Civil War, Forrest had already amassed a fortune as a planter, real estate investor, and slave trader. He was one of the few officers in either army to enlist as a private and be promoted to general officer and corps commander during the war. Although Forrest lacked formal military education, he had a gift for leadership, strategy, and tactics. He created and established new doctrines for mobile forces, earning the nickname The Wizard of the Saddle. After the Civil War, Forrest and most Southerners railed against the Northern-implemented Reconstruction effort. He was a pledged delegate from Tennessee to the New York Democratic National Convention of July 1868. He served as the first Grand Wizard of the Ku Klux Klan, but later distanced himself from the organization. Tom Roza’s main interest in the Civil War has focused on what type of people fought in the war as opposed to the actual battles. The presentation on Nathan Bedford Forrest follows in line with most of Tom’s presentations on John Buford, Winfield Scott Hancock, Jeb Stuart at Yellow Tavern, A.P. Hill, and Robert Gould Shaw. Tom also presented an in-depth two part presentation of Robert E. Lee’s first invasion of the north in September 1862, which culminated in the Battle of Antietam. This entry was posted in Meeting archive on March 28, 2017 by hlj. Civil War Quiz: What Do You Know About the Assassination of President Lincoln? Q#1 – What did President Lincoln dream just a few nights before the events of April 14, 1865? Q#2 – What was the name of John Wilkes Booth’s father? Q#3 – John Wilkes Booth had a brother named Edwin. Was Edwin older or younger than John? Q#4 – John Wilkes Booth sympathized strongly with the South. A number of historians suggest there were three contributing factors for this sympathy – what were they? Q#5 – In 1859, Booth witnessed the execution of John Brown. What were his reactions to the execution? Q#6 – In the fall of 1864, what plot did Booth come up with that did not involve assassinating President Lincoln? Q#7 – What was the name of the woman who gave Booth a special ticket to attend the March 4, 1865, Inauguration of President Lincoln? Q#8 – How did Lincoln’s visit to Richmond on April 2 indirectly result in the assassination of the President? Q#9 – On April 14, 1865, Booth ordered Lewis Paine to assassinate which Union General. And when that plot failed, who was the next target for Paine? Q#10 – What type of pistol did Booth use to assassinate President Lincoln? Q#11 – Who was the politician that George Atzerodt was supposed to assassinate? Q#12 – On April 14, 1865, what were the names of the betrothed couple who were guests in the box at Ford’s Theater with the Lincolns? Q#13 – What are the two most likely reasons why John Parker, the person assigned to guard the Presidential box at Ford’s Theater, was not present at the time of the assassination? Q#14 – Which leg did Booth break when jumping to the stage after he shot Lincoln? Q#15 – 23 year old surgeon Charles A. Leale was the first doctor to reach Lincoln in the Presidential box. What medical procedure did Leale perform that relieved pressure on Lincoln’s brain? This entry was posted in Quiz on March 25, 2017 by hlj.